Governor Andrew M. Cuomo today announced that Syracuse Police Officer Kelsey Francemone is the recipient of the New York State Police Officer of the Year Award, the first woman to be honored as the sole recipient of the award in its 33-year history. She was recognized for her actions on Father's Day 2016, when she disabled a gunman who began shooting during a large party at the James Geddes Apartments in Syracuse's Near Westside neighborhood. Francemone, who was patrolling alone when gunfire erupted, also successfully defended herself when members of the crowd attacked her as she attempted to secure the area. "Officer Francemone answered the call and put her own wellbeing on the line in order to protect her community and prevent others from being harmed by this gunman," Governor Cuomo said. "Her courage bravery exemplifies the very best of New York's law enforcement community and she serves as an inspiration for us all. On behalf of all New Yorkers, I am proud to honor her with this well-deserved award." Lieutenant Governor Kathy Hochul presented the 24-year-old Francemone with the award on the Governor's behalf this afternoon. She was joined by Michael C. Green, Executive Deputy Commissioner of the state Division of Criminal Justice Services and Chairman of the Police Officer of the Year Selection Committee, and Syracuse Chief Frank J. Fowler. 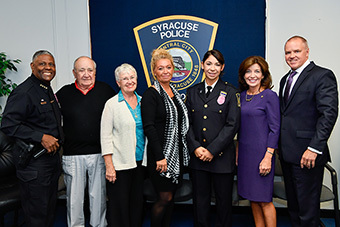 More than 50 people attended the award ceremony at the Syracuse Police Department, including Francemone's family members, friends, colleagues from her agency and law enforcement executives and officers from throughout Onondaga County. "Officer Francemone is not only a hero, but as the first female recipient of the Police Officer of the Year Award, is a great role model for women and girls across the state," said Lieutenant Governor Kathy Hochul. "She faced up to every officer's worst nightmare and used her training and incredible bravery to confront it head on. Officer Francemone and the Officer of the Year nominees represent the strength and courage that Officers display across New York State every day." A member of the Syracuse Police Department since 2014, Francemone also is the first officer from an Onondaga County agency to receive the award. Three other women - officers with the New York City Police Department, Port Authority Police Department, and Suffolk County Police Department - were joint recipients of the award with their male colleagues. Division of Criminal Justice Services Executive Deputy Commissioner and Police Officer of the Year Selection Committee Chairman Michael C. Green said, "Officer Francemone put her own safety aside to help countless others facing a lethal volley of gunfire. While all the nominations received by the committee include exemplary acts of heroism, the actions of Officer Francemone truly represent what it means to serve and protect the public. I am honored to recognize her valor on behalf of the committee." It was about 11 p.m. when Francemone - who was 22 at the time - responded to a report of a man down, not far from where she was patrolling. The initial call was unfounded, but she heard multiple gunshots originating from disorderly crowd of several hundred gathered at a large party nearby at the Geddes Apartments. Without hesitation, she ran toward the direction of the gunshots as panicked people streamed in the opposite direction, and confronted an armed man, who was firing a handgun at other individuals in the crowd. Francemone ordered the individual to drop his weapon. When he didn't comply with her direction, she shot him once, wounding him. The man dropped his weapon and fled around a corner of a building, out of her line of sight. When she attempted secure the scene and locate the injured man, she was encircled by the crowd, members of which began to physically attack her. As she was besieged by punches and kicks, her uniform was ripped by individuals attempting to take her badge and service weapon. Francemone defended herself throughout the attack, refusing to relinquish either item. Officers responding to the scene pulled their colleague from the melee, but were mobbed by the unruly crowd. The ensuing riot prompted Syracuse Police to seek mutual aid from police agencies throughout Onondaga County. After the incident was under control, investigators later recovered nearly 40 shell casings from the scene and estimated there were roughly a half-dozen gunmen firing weapons in the officers' proximity. Syracuse Police Chief Frank Fowler said, "If not for Officer Francemone's quick response and almost unbelievable personal courage, it is almost certain more people would have lost their lives in this tragic gunfight. She has brought great credit upon herself and the Syracuse Police Department as a whole. We are proud to have her among our ranks." The Police Officer of the Year Award was first presented in 1984 and recognizes a single police officer, or team of officers, for an exceptional act of valor symbolizing the service of police in New York State. A complete list of past recipients can be found here. Since the award's inception, 111 officers from 18 agencies across the state have received it. Of those police, 69 have been honored posthumously, including 23 officers from the New York City Police Department and 37 members of the Port Authority of New York/New Jersey Police Department killed during the terrorist attack on the World Trade Center on Sept. 11, 2001. On June 28, at about 2:30 p.m., Officers Perez and Rodriguez observed a vehicle on fire near the center divider on the Long Island Expressway. The officers ran to the vehicle, found the operator unresponsive, cut the seatbelt and pulled the driver from the vehicle. Officer Perez stayed with the injured driver while Officer Rodriguez used an extinguisher to extinguish the fire. On Nov. 4, First Precinct Police Officer Sanford began pursuing a vehicle on the Southern State Parkway with a potentially armed driver wanted for a homicide. Officer Fusaro became the lead car in the pursuit with assistance from Officers Mirenda, Darnell White and Kalendar. The driver fled into Brooklyn, where he crashed his car into a gas station, causing a fire at the pumps. He then fled the vehicle and charged at Officer Fusaro, knocking him to the ground and causing him to suffer a head injury. Officers Mirenda, White and Kalendar were then able to subdue the man. On Nov. 4, Sgt. Tuozzolo and another officer located a suspect who had held his estranged wife and her family hostage for several hours before leaving the scene. Sgt. Tuozzolo and another officer located the man and boxed in his vehicle to prevent him from fleeing again. As Sgt. Tuozzolo and the other officer exited a patrol car to arrest the suspect, he opened fire and shot Sgt. Tuozzolo in the head, killing him. The other officer, who was shot in the leg, survived. On Nov 29, Lt. Liza Bobseine and Officer James Davey were investigating a trespassing complaint and reports of illegal hunting and shots fired. Officer Davey was critically wounded when an individual at the scene opened fire as the officers approached. Lt. Bobseine called for medical support and administered life-saving treatment to Officer Davey for more than an hour. Lt. Bobseine also controlled the scene and took the two individuals in custody, leading to their arrests. On Dec. 13, Technical Lt. McLain and Technical Sgt. Rumrill braved poor conditions to fly a helicopter in search of a pair of hikers who had become lost in Essex County. The man and women had fallen about 100 feet from the summit of Algonquin Mountain - New York's second highest peak - and had been stranded for two days. Both hikers were suffering from frostbite and hypothermia, which made removing them by ground all but impossible. After forest rangers located the position of the hikers, Technical Lt. McLain and Technical Sgt. Rumrill used a roughly 45-second break in the cloud cover to hoist the hikers aboard. They transported the hikers to an area hospital for treatment and then returned to extracted a pair of forest rangers who were exhausted from the search. On Nov. 11, Deputy Walter responded to a vehicle crash in front of a residence in the town of Pendleton. The impact of the vehicle as it struck a tree had pushed the engine into the vehicle's passenger compartment, pinning the legs of the driver. Deputy Walter, along with one of the neighbors, freed the driver's legs and pulled him from the vehicle shortly before it erupted in flames.